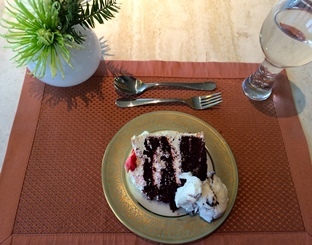 For many of us, dessert is the favorite course of the meal. There's always something to love about dessert! The dessert utensils are at the top of your place setting. 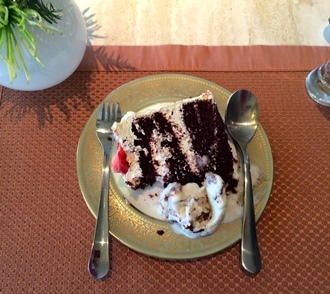 When your dessert consists of both harder and softer textures, a fork and spoon will be included and both will be used. The meal has ended, and dessert has been served. 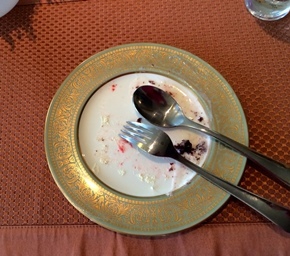 Once dessert is served, move the spoon and fork down to either side of the plate - fork on the left and spoon on the right. The fork is placed in the palm of the left hand and the spoon is placed in the palm of the right hand. 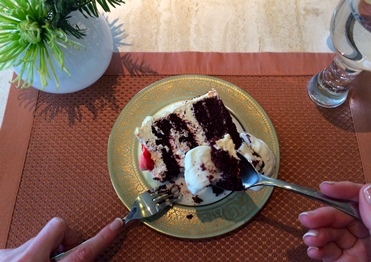 The spoon first serves as a knife and the fork is used to steady the solid portion of the dessert. The spoon is then re-positioned in the right hand, holding in ‘pencil’ position. 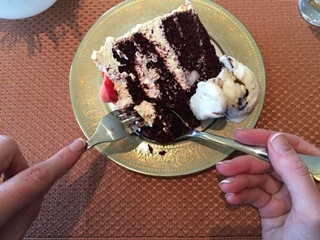 The fork becomes a ‘mover’ assisting in positioning both the cake and the ice cream on the spoon. 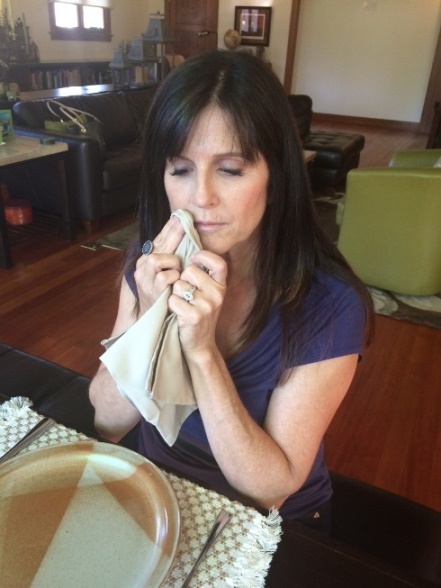 As with other courses, there are resting and close-out positions for your utensils. 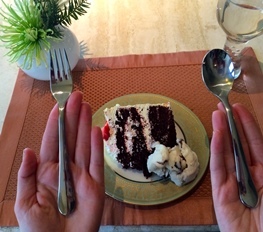 The dessert resting position is your fork on the left side of the plate, and your spoon on the right as shown here. 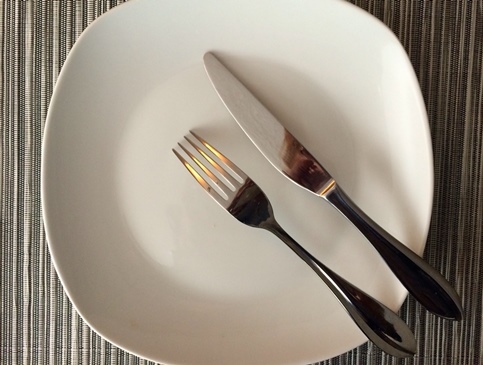 The close-out position is the same as other courses, with fork and spoon diagonal on the plate, or in the 6 o'clock position. 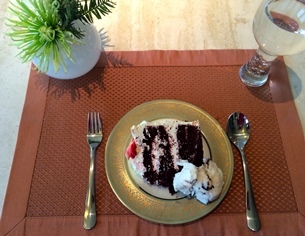 Serve cake and ice cream or pie a la mode at your next family meal, and practice using both a fork and a spoon to enjoy your dessert. 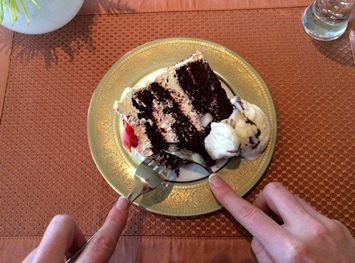 Other times, if your dessert is solid, you only need a fork. If your dessert is liquid or soft, you only need a spoon. 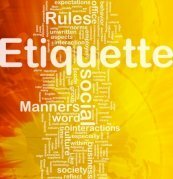 If you are setting the table, include only the utensils that are needed to eat the particular dessert that is to be served.